OMG, I super love it!! I didn’t know I could feel this way about a counter top. Our new counter top by Samsung, under their “Staron” brand. 2013 update: I think Samsung stopped making it. The Staron website is dead and Home Depot doesn’t carry samples for it anymore. Wtf, why? My solid surface countertop is AMAZING. 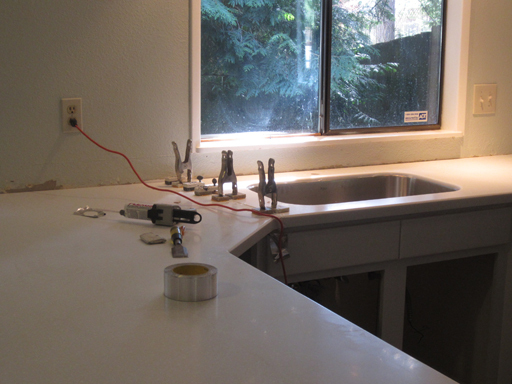 Old pinkish laminate counter top which was miraculously undamaged, despite our best efforts to “test it”. Also: crappy two-bowl sink that always looks dirty and is too small for anything. Our new Samsung Staron counter top is a BEAUTY! Perfect little white flakes give the surface an almost shimmery snow-like quality. I especially love the lack of grey flecks. Most of the “white with flecks” counter top options looked too much like cookies ‘n cream to me. This one is like gazing into a gorgeous blizzard. The seam is practically invisible. I can only find it because I know where it is, but even then it takes me a moment to spot it sometimes. 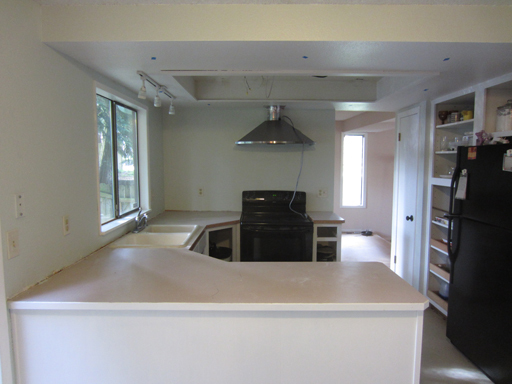 The “seam-baking” step of the countertop installation was my favorite. The installers glued little blocks (small Staron samples?) to the countertop then put these strong clips on while the seam “baked”. Dad and I both were looking at these when one suddenly EXPLODED off and freaked us both out!! We didn’t go near it again after that. At this point I thought the seam was huge and hideous, but it cleaned up so nice the seam has really all but vanished. LOOK AT THIS HUGE SINK, OMG!!! 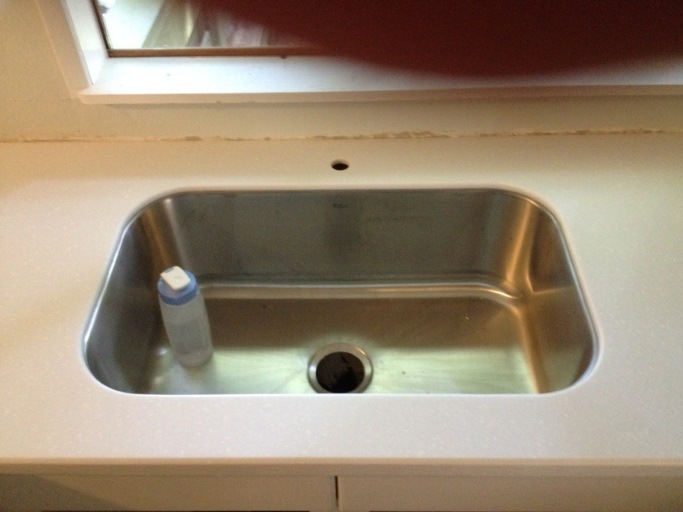 It’s a Kraus 31 1/2″ undermount single bowl 16 gauge stainless steel sink and it is AWESOME. That water bottle holds 20 oz. Every pan I own can fit into this sink. I ordered the sink from Amazon, mostly due to not being able to find anything like it locally but also because it was only $370, way less than I expected to pay for such a gigantic sink. The sink is very light weight and all I had to do was hand it off to the guy who came to measure our countertop. All in all, this new countertop is a huge raging success. 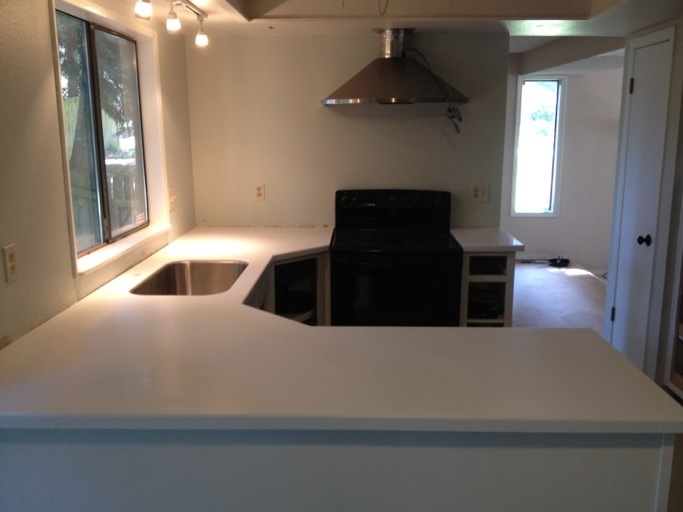 The solid surface is beautiful, the gigantic sink is amazing.